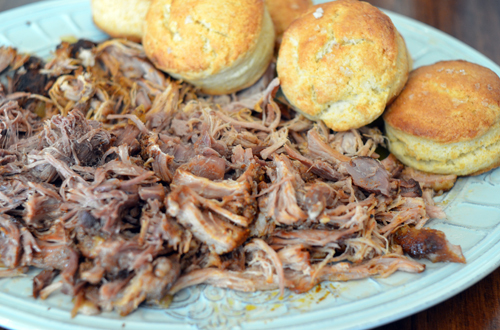 Pixel Whisk: Maple Glazed Biscuits....Oh, and Pulled Pork Too. 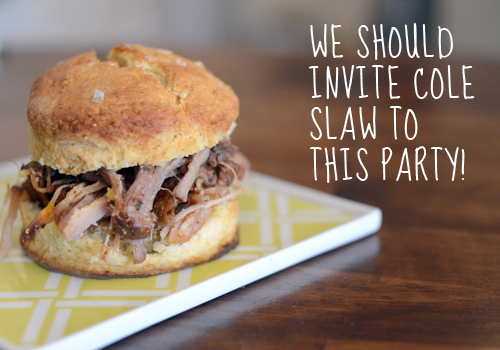 Maple Glazed Biscuits....Oh, and Pulled Pork Too. 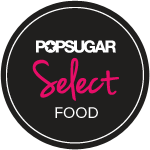 Gilt Taste recently invited me to sample some of their amazing products (lucky me!) This post incorporates the fine ingredients they sent me, including a bottle of Blis Maple Syrup and a Becker Lane pork shoulder. The second I opened the syrup it I knew I wanted to cook with it. 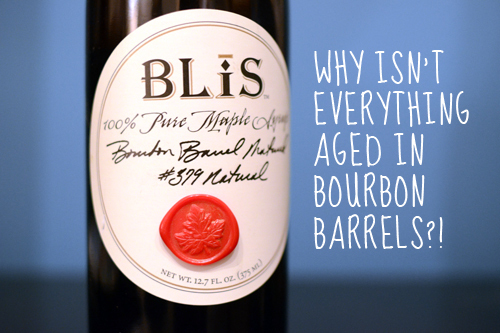 Since it's aged in bourbon barrels the syrup is slightly smokey, not overly sweet and has a great vanilla aroma. But here's the thing, I'd be lying if I said I was a connoisseur of fancy maple syrups. I have purchased my fair share of pure maple syrup, but most still sit unopened in my cabinet. It's just that I was raised on the cheap stuff and I happen to love it. My high fructose friend, Aunt Jemima, will always have her place atop a warm stack of pancakes on a cold Sunday morning. However, when it comes to baking and cooking with maple syrup, the real stuff is the only way to go. I may not top my pancakes with it just yet, but I can think of about a million other ways to use it in the kitchen–one of which was the perfect upgrade to my traditional biscuit recipe. As my biscuits were baking, I started thinking of other ways I could use this magic maple syrup. Tempted to make something sweet like a bourbon pecan pie, I instead decided to go with a savory recipe. I created a rub with the maple syrup and a bunch of spices, then slow roasted the tasty pork shoulder. 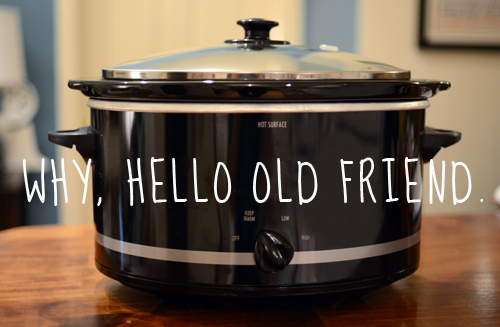 It was great dusting off the old slow cooker and sitting back while she did all the work. The result: an amazing pulled pork biscuit sandwich! My husband was in heaven and I'm pretty sure my dogs spent the entire night staring at the slow cooker in all her majesty. 1. Preheat the oven to 450 degrees and line a baking sheet with parchment paper or a non-stick liner. 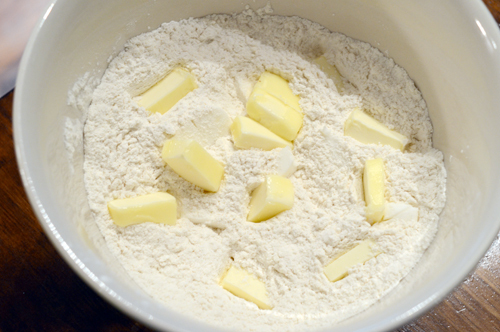 In a large bowl, combine the flour, baking powder, baking soda and salt. 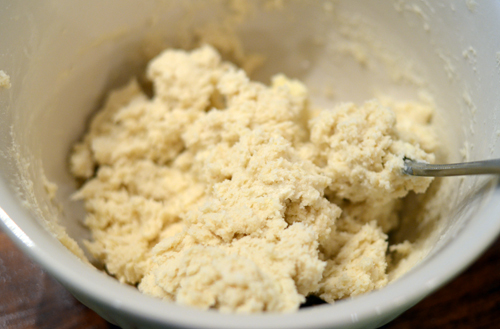 Use your fingertips to rub the butter and shortening into the dry ingredients until small crumbs form. Make a well in the center and pour in the heavy cream and ¼ cup of the maple syrup. Use a fork to combine the wet and dry ingredients just until the dough comes together (dough will be sticky). 2. Turn dough onto a lightly floured work surface and fold/pat into disk about an inch thick. 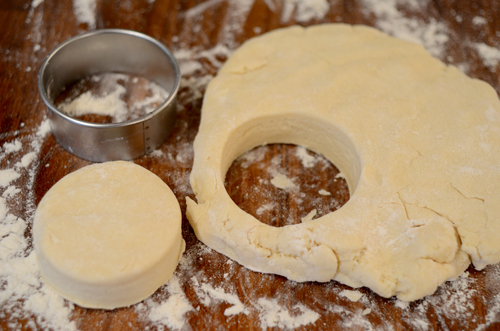 Use a 2-inch round circle cutter to cut out biscuits and place them directly on the lined baking sheet. 3. 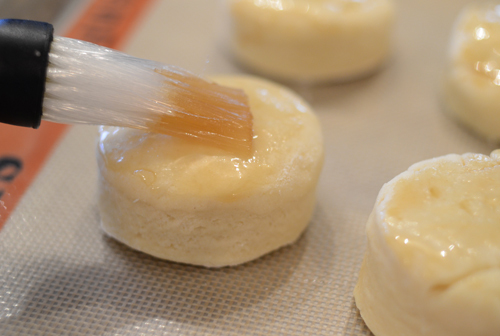 Use a pastry brush to brush the remaining 2 tablespoons of maple syrup on the tops of the biscuits. 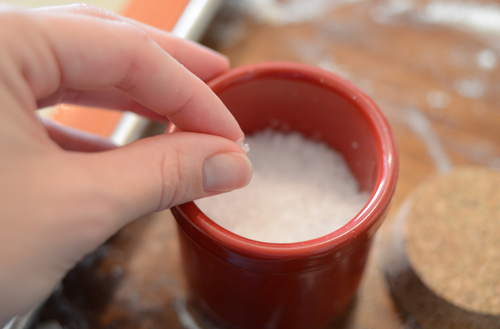 Then sprinkle with a few flakes of sea salt (like Maldon). 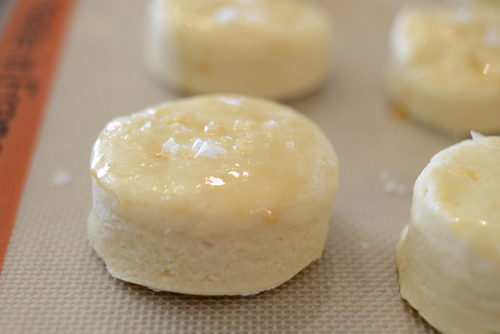 Bake for 15 minutes, or until biscuits are risen and golden on the tops. 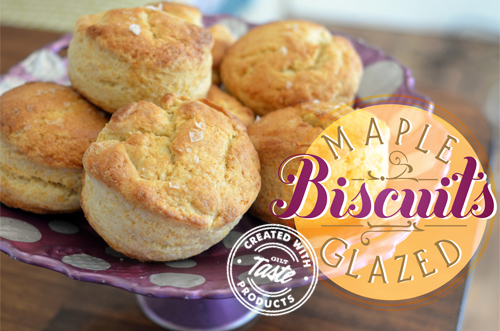 GET THE BISCUITS RECIPE CARD HERE. 1. 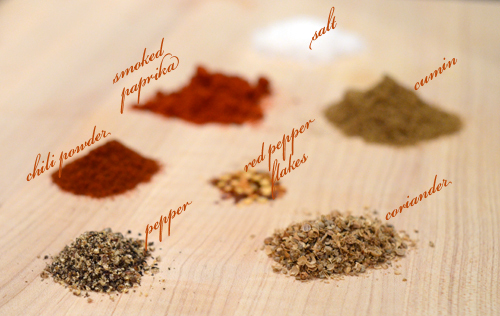 Combine the paprika, salt, cumin, chili powder, ground pepper, coriander and red paper flakes in a small bowl. 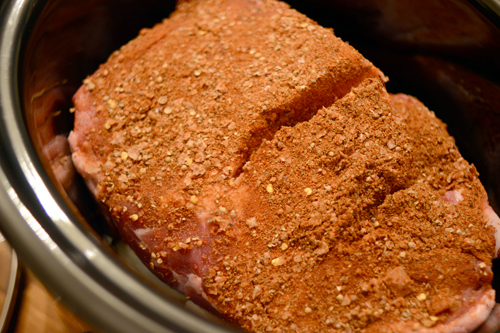 Rub the maple syrup into the pork shoulder, then sprinkle the spice mixture on top making sure to cover the entire top of the shoulder. 2. 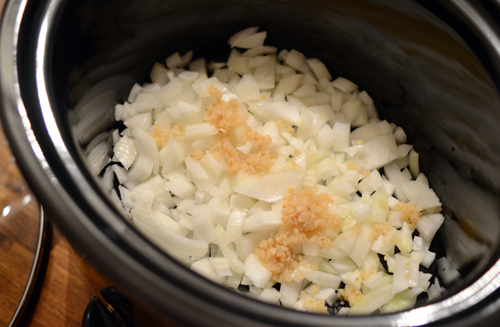 Add the onions and garlic to the slow cooker, then place the pork shoulder on top. 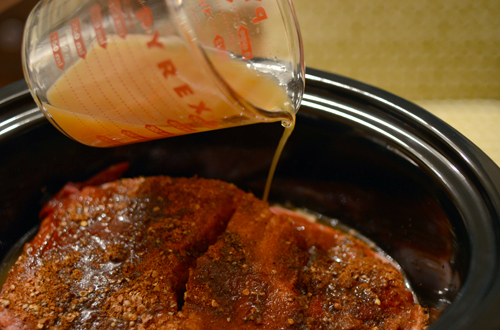 Pour the apple cider around the pork and place the lid on the slow cooker. Set the heat on low and cook for 8-10 hours. 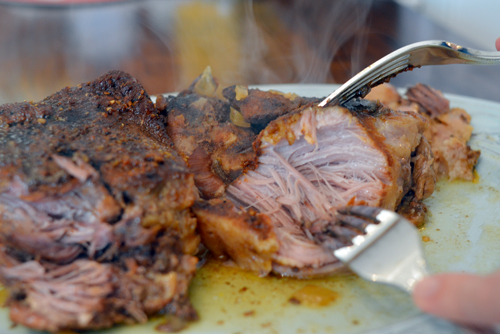 Place the pork on a serving platter and it will shred easily with 2 forks. Discard the fatty parts and serve while it's still warm. I always throw some cole slaw and a few pickles on top of my pulled pork, but it's just as delicious as is.